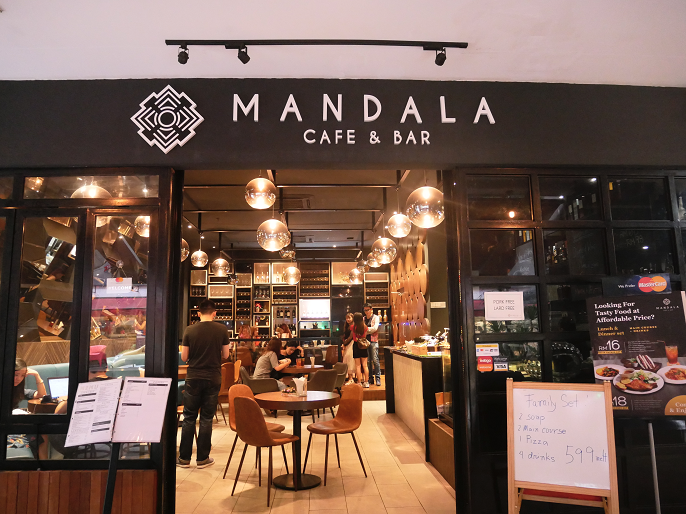 Mandala Cafe & Bar is located in the building outside the Publika mall. 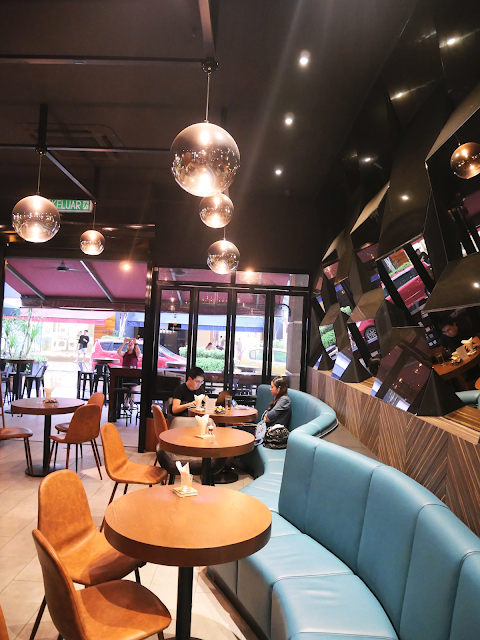 There are quite a number of restaurants, cafes, bars at the outside Publika mall, so it actually took me a while to locate the restaurant. 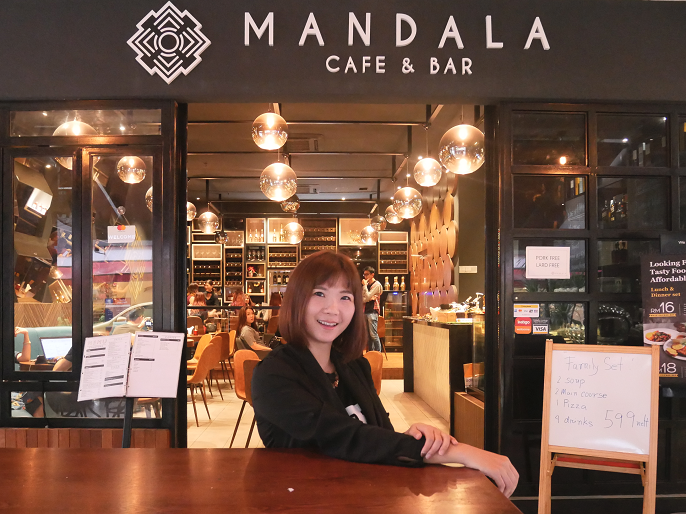 Well, if you know about the Banana Curry Hour restaurant, an Indian restaurant, Mandala Cafe & Bar is just situated right next to it. 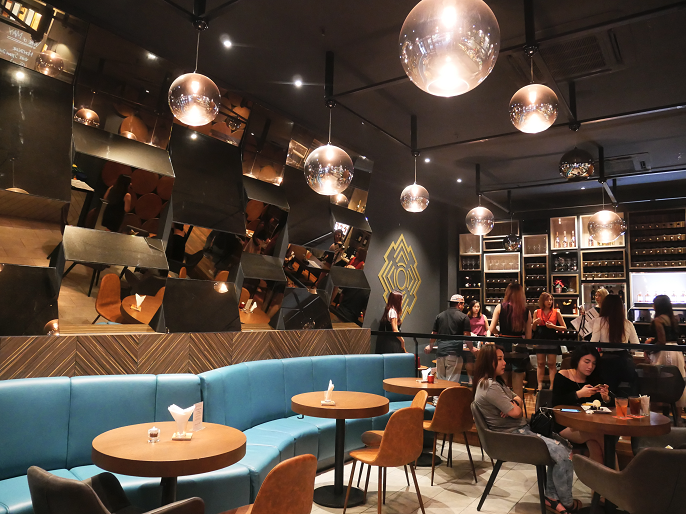 The restaurant is not very spacious, but the interior design turns the whole area into a beautiful place. It features many elements made from different materials and make the room looks contemporary and stylish. 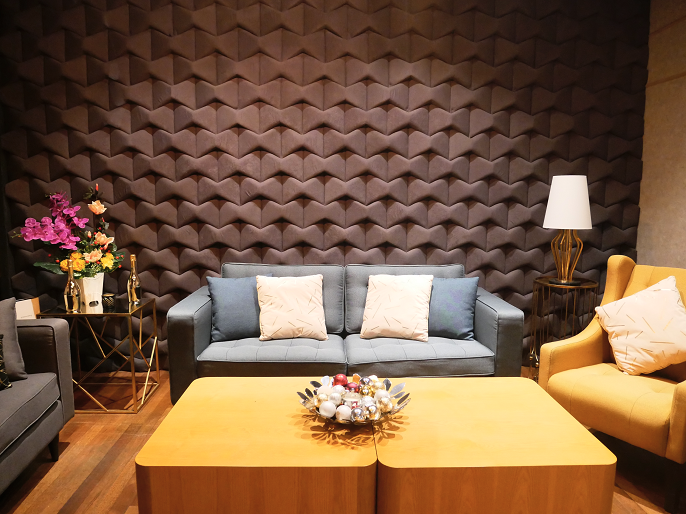 I also kinda like the colour palette and the materials they used because it makes the place look so comfortable. It really provides an inviting atmosphere to the guests. 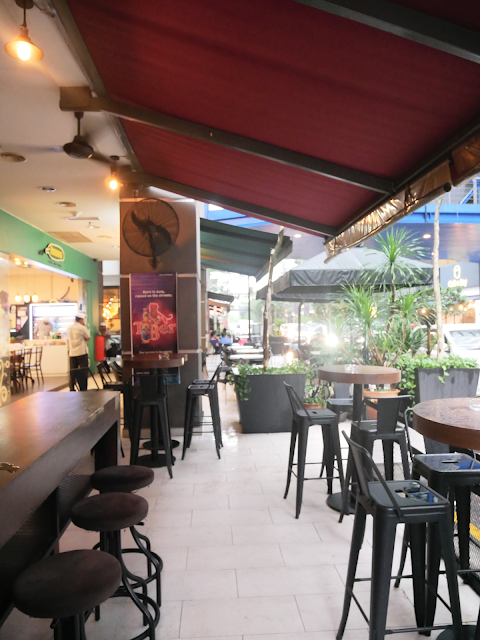 The restaurant also has a simple uncluttered outdoor seating area too. 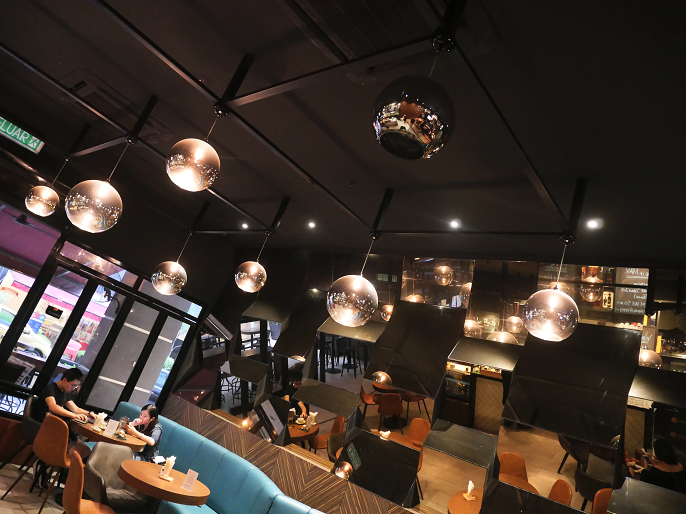 If you are looking for a place to organize a small event or party, there is also a VIP room at the back of the main dining area. 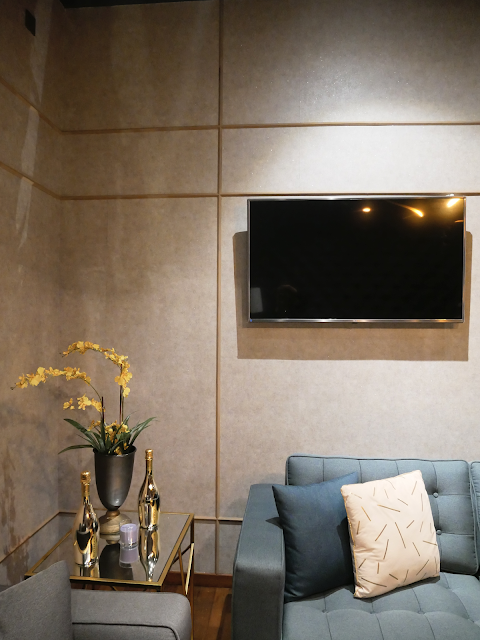 This special room can occupy with a group of 10 pax, with minimum RM1,000 spending requirements. Spotted a wine cellar with different red and white wines. 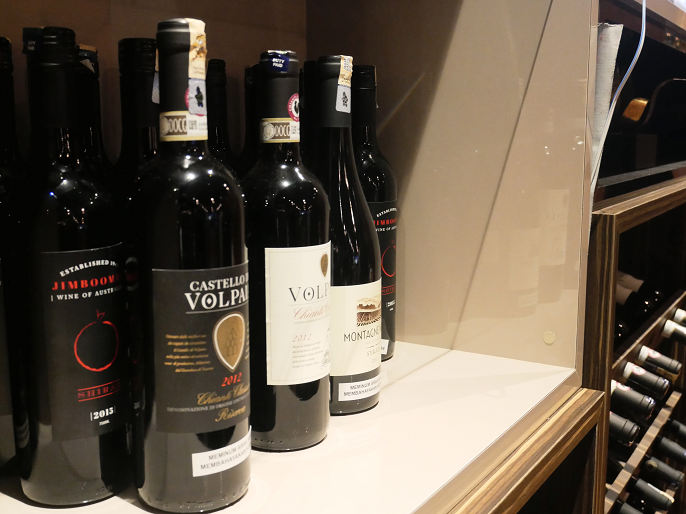 It's a certainly a good place for you to choose the right wines to pair with all sorts of delicious dishes. 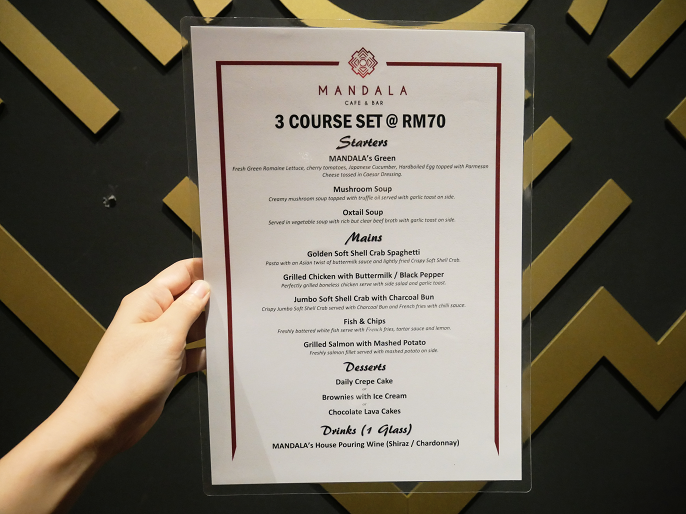 One of the reasons I visited Mandala Cafe & Bar is because I like to try different variety eatery and concept, and another reason is because of the 3 Course Set @ RM70 they just launched recently. The set meal includes starter + main course + dessert + a glass of their in-house red/ white wine. There are many options for the starter, main course and dessert, so basically you can just mix and match with your favourite dishes from the list to complete the 3 course set meal. Shall we start with the starters now? 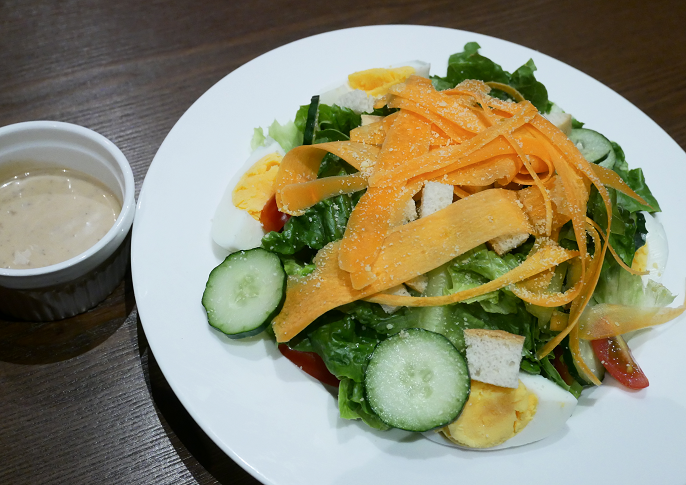 Mandala's Green comes with fresh green romaine lettuce, cherry tomatoes, Japanese cucumber, carrot slices, half boiled egg topped with Parmesan cheese, bread cubes and tossed in Caesar dressing. Love the great taste and smell of the carrot! 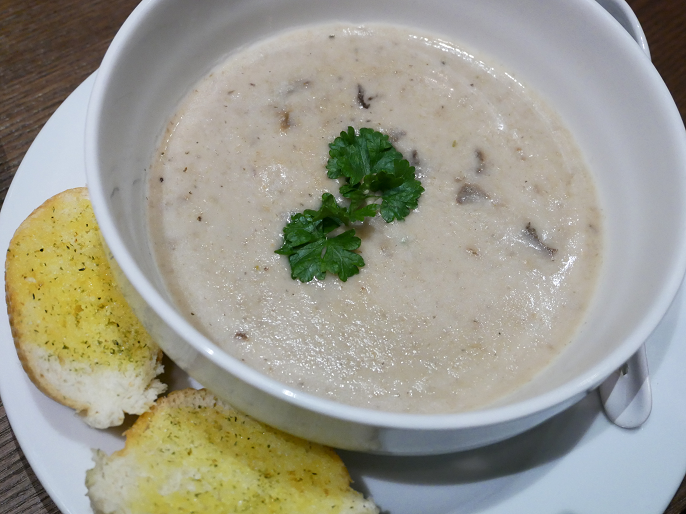 Mushroom Soup is a creamy soup topped with truffle oil and served with 2 pieces of garlic toast on side. Oxtail Soup served in vegetable soup with rich but clear beef broth, and also comes with 2 pieces of garlic toast on side. 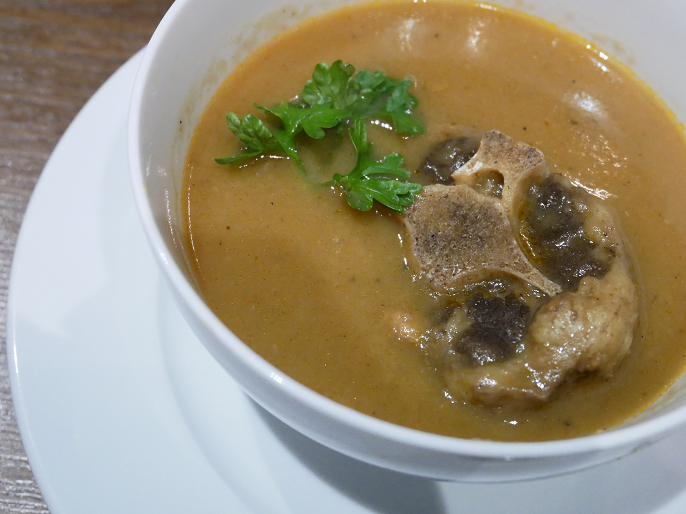 It's such a lovely rich soup that can make you feel warm and comforting. Move on to the 5 options from the main course now. 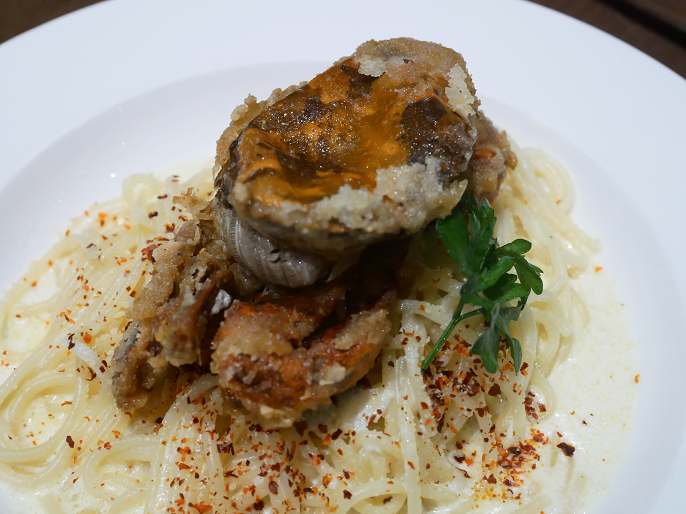 Golden Soft Shell Crab Spaghetti is a Carbonara pasta that served with an Asian twist of buttermilk sauce and lightly fried crispy soft shell crab. I'm pretty impressed with this dish as it is quite well balance in overall taste; with a salty taste on the soft shell crab added on to the pasta was an ideal dish. 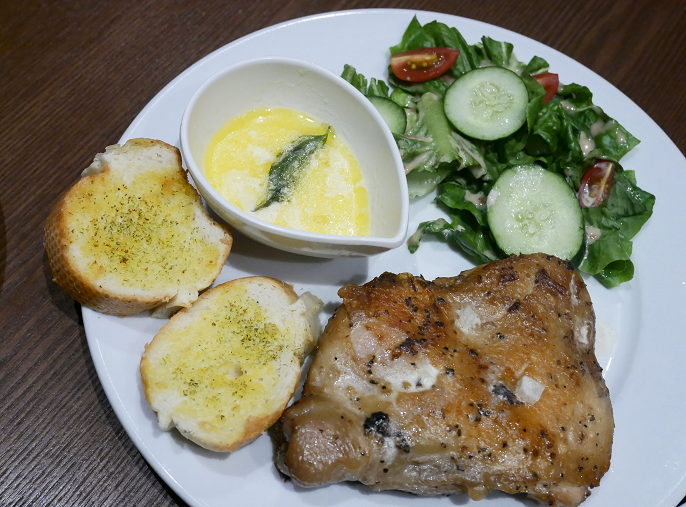 Grilled Chicken with Buttermilk is a perfect grilled boneless chicken that serves with side salad and garlic toast. I find the chicken has a light taste of the wolf-berries which I enjoyed it very much. Also, with the buttermilk coating, it really makes the chicken meats taste so juicy and moist! 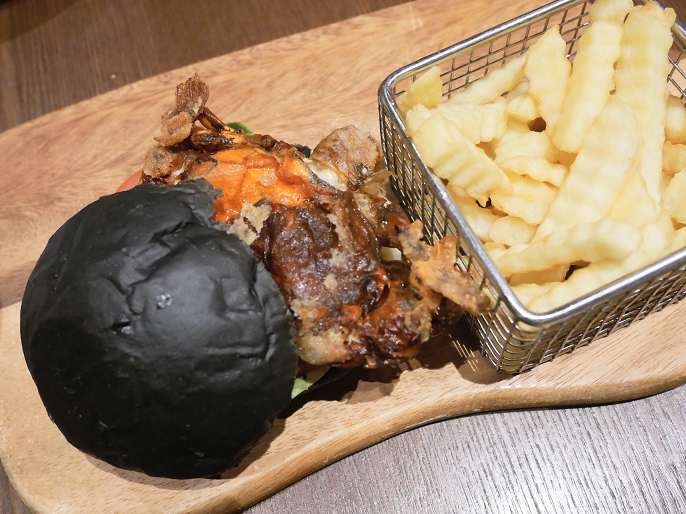 Jumbo Soft Shell Crab with Charcoal Bun is a crispy jumbo soft shell crab served with charcoal bun, french fries and chili sauce. Tucked in between buns, the soft shell crab is served with a sunny-side egg to meet a healthy balance of sweet and savoury taste. 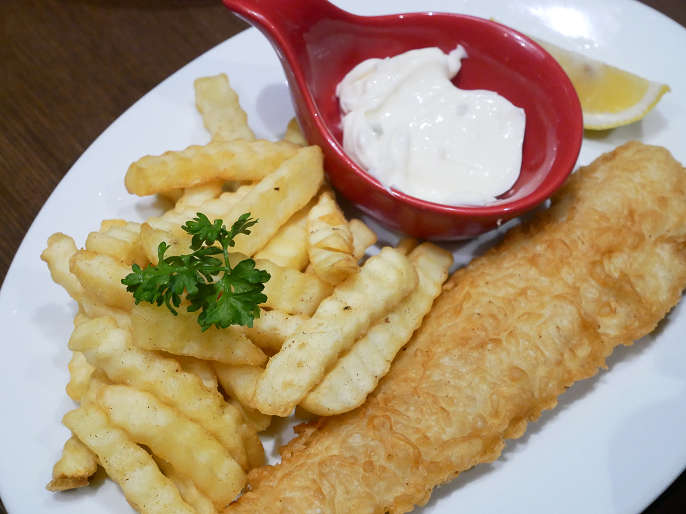 Fish & Chips are freshly battered white fish served with a side of french fries, tartar sauce and lemon. It's a simple and straight-forward dish that leaving the meat as moist and juicy yet crackling crisp crust when giving it a bite. Are you a lover of salmon? 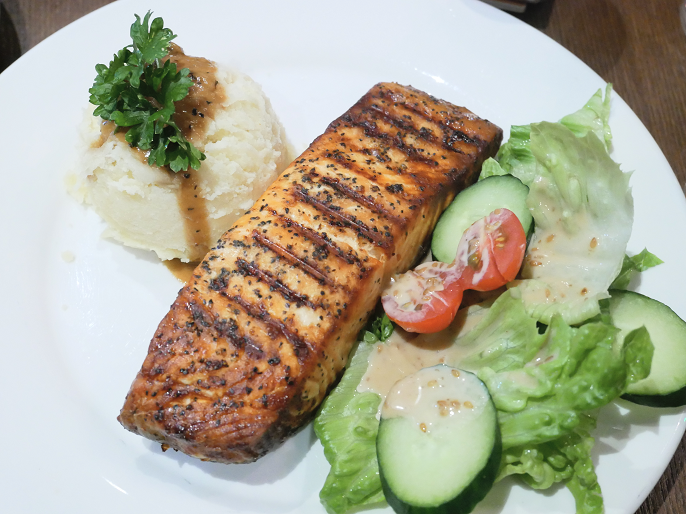 Grilled Salmon with Mashed Potato is freshly salmon fillet served with a side of finely mashed potato, and a generous amount of fresh salad. 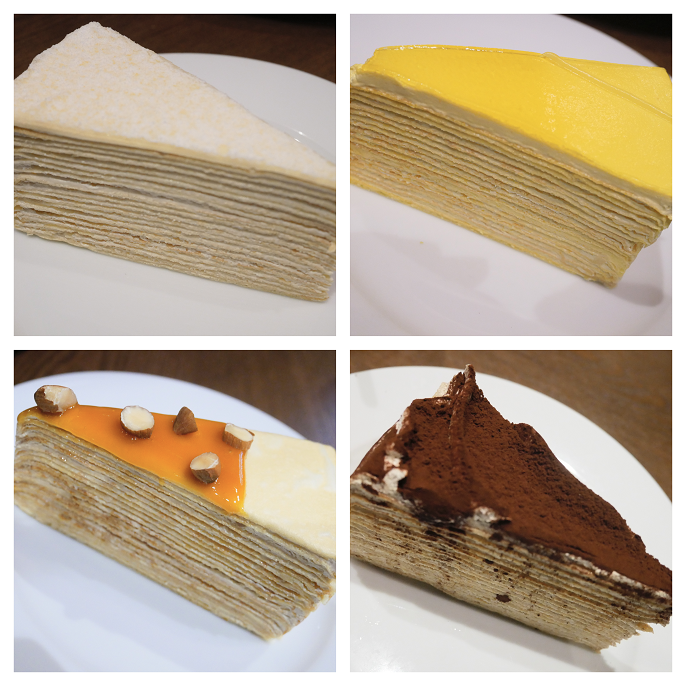 Daily Crepe Cake has variety flavours and the choices may different from time to time. To be honest, it's hard to choose which flavours I like the most, because all these 4 flavours that I tried are really super good. I can really have more than one piece at a time by myself! 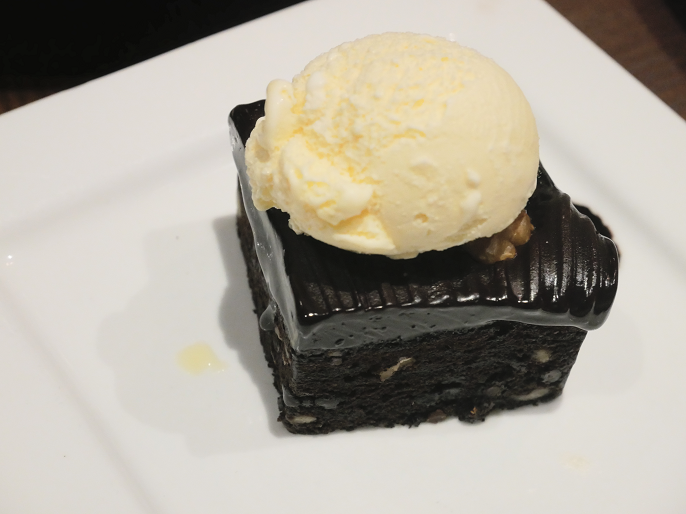 Other than the crepe cakes, you can also choose the Brownies with Ice-cream that topped with a scoop of vanilla ice-cream. 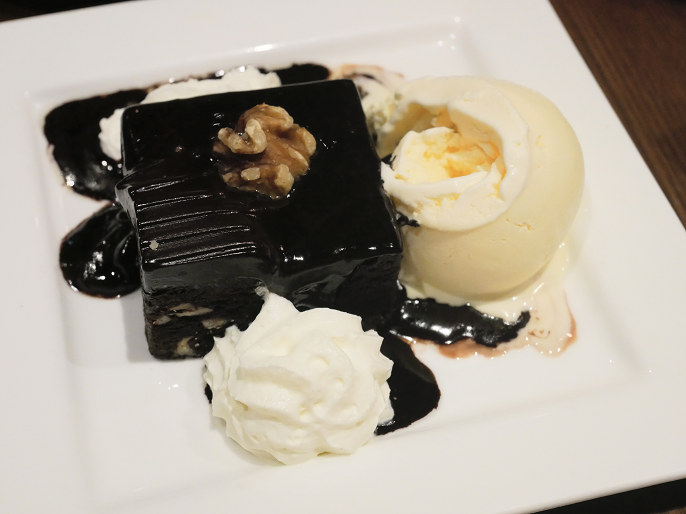 The whole thing is so chocolaty, and the texture is so moist, which makes it such a delicious classic dessert to enjoy! All the 3 Course Set Meal also comes with one glass of Mandala's House Pouring Wine with either Shiraz or Chardonnay. 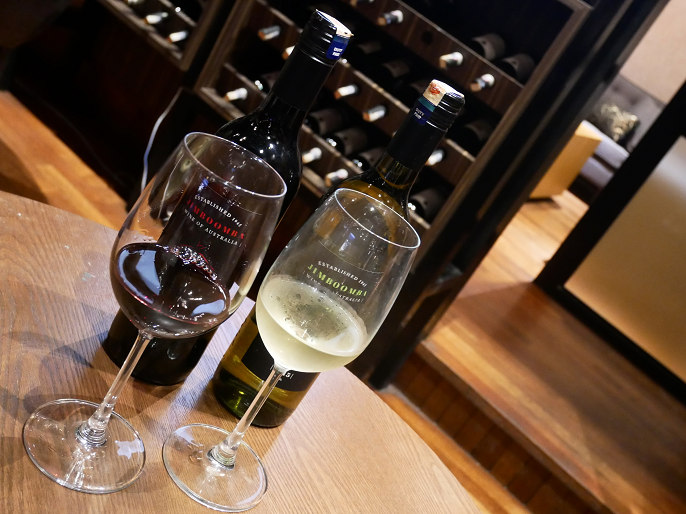 As a wine lover, I think the wine is pretty smooth and taste beautiful. Some of the main courses from the 3 Course set meals are also available in Ala-Carte menu, such as the Golden Soft Shell Crab Spaghetti @ RM28, Grilled Chicken with Buttermilk @ RM20 and Fish & Chips @ RM23. 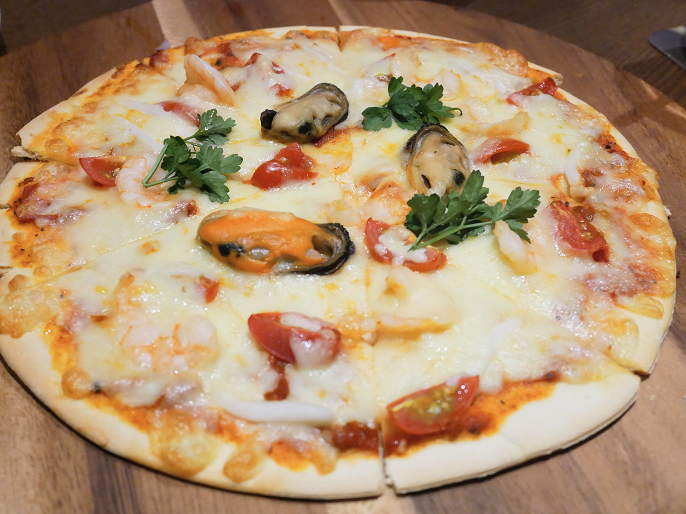 If you like pizza, I would recommend to try the Pizza Margherita @ RM18, a typical Neapolitan pizza that served with Mozzarella cheese and cherry tomatoes. I believe you can handle more than one piece with this thin-crust pizza! It was a great experience and great restaurant to enjoy it in. The set meal that provides a glass of wine, a starter, a main course and a dessert is such a perfect meal that needed to give it a try. Personally, I think the prices are reasonable and the food tastes are good and also well presented. 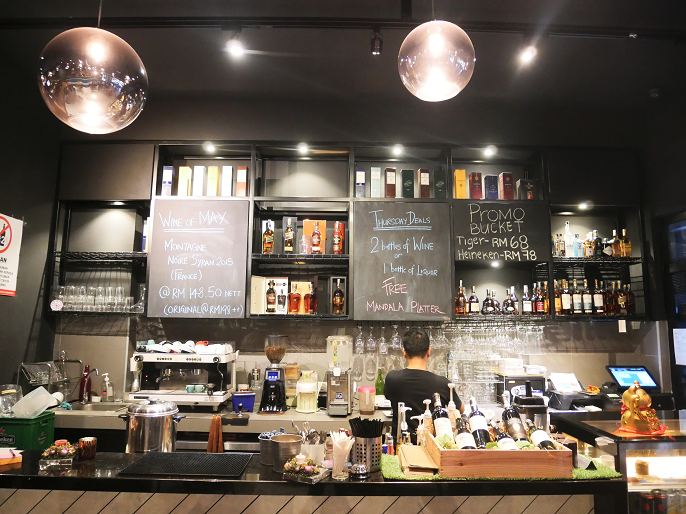 I think normally a glass of in-house wine at some other restaurants would cost around RM20, and probably a starter and a dessert would cost about RM20 of each? So, I think the full set meal @ RM70 at Mandala Cafe & Bar is really worth a try!